ROOMSPIRATION || BACK TO SCHOOL | RAWR BOWS. I know I know, it's way too early for a back to school post. I mean, it's only August! However, a) many people go back to school in August/early September and b) it's a roomspiration post so technically it's not really back to school related unless going back to school means moving into a new apartment like in my case. A new school year means moving into a new flat/house and getting to decorate a whole new bedroom which makes me maybe a bit too excited. 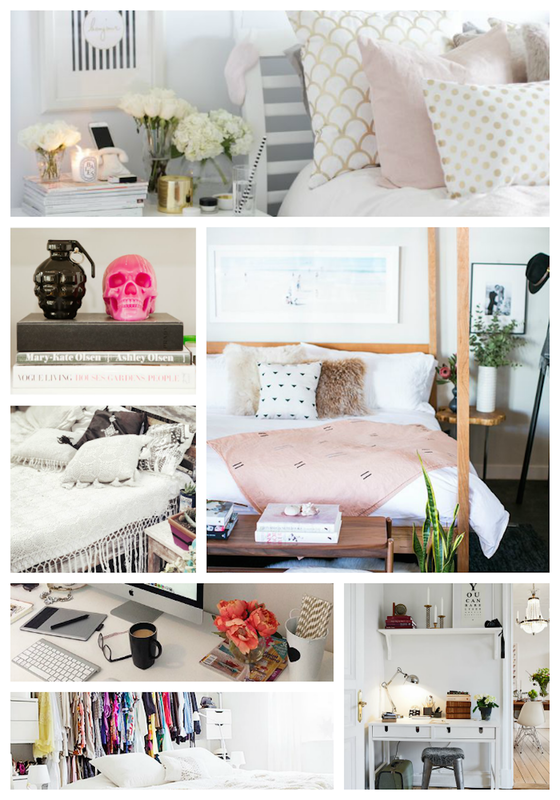 Every summer, toward the end of July, I work my way back to Pinterest and start pinning some room decor inspiration for my new room. When I go back to London in Septmeber I usually go to my 'Roomspiration' board and get an idea of what I want my room to look like before going to Ikea/ Zara Home / anywhere that sells room decor. This year is no different so I thought I would share my board with you in case you are moving as well or you just enjoy looking at pretty bedrooms (I know I do)! It's not hard to see I like white bedrooms. I think white bedrooms look more spacious and gives it a cleaner look. I also love having golden decor around the room to give it a more elegant and expensive look without overdoing it - maybe a pillow with golden details or some golden jewellery on display. Something else I love is making my bed extremely cosy and comfy (which I regret every morning when I have to get up). I love having loads of big pillows and big furry blanket for the extra cold nights!